As much as I love putting on a pretty pair of heels for a night out, I definitely don’t enjoy being the tallest person in the room every night. In even my shortest pair of pumps, I’m still six feet tall… and you should see me in my Prada platforms – I’m 6’4 those nights! If I know I’m going to be walking around quite a bit or the function I’m going to isn’t super fancy, I like to jazz up a dress with some sparkling sandals. They put the “fun” in functional, are super comfortable, and are a wonderful elevated option for day or night! I’ve been stalking this pair at Kate Spade for months, but they just got marked down. The jewels on these sandals are what initially drew me in, but the gorgeous neutral color scheme of black, gold and smokey grey sold me. They look so good with all of my regular basics and go-to’s! I’ll definitely be taking these babies with me to Europe. Kate Spade has actually marked down SO MANY THINGS in the last week. A few other pieces you won’t want to miss include this beautifully bright green floral dress, this bow-adorned straw tote, these gold slip-on sandals (now under $100! ), and this two-in-one limoncello cosmetic/toiletry case. Click here to discover more of their amazing sale! Your sandals are soooo cute. I’ve been eyeing a few off the shoulder dresses, and I LOVE this one! It’s going to be so hard to narrow down your wardrobe for Europe! I hope this dress also makes the cut. It looks lovely on you. 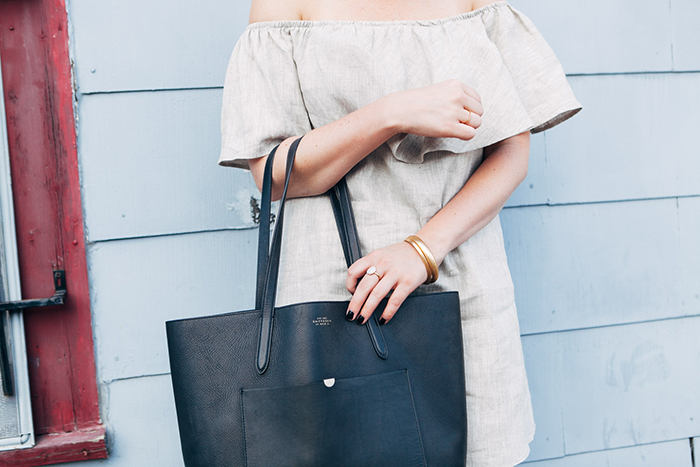 Love the easy feminine shape of this dress – perfect for those summer heat waves! You seriously have the best neutral pieces! I love this outfit! I totally get what you’re saying by not always wanting to be the tallest person in the room. I’m also 6 feet (without heels). I’ve definitely been 6’5″ before!!! Great option for cute shoes! Love the dress and the jeweled sandals. Great summer look! 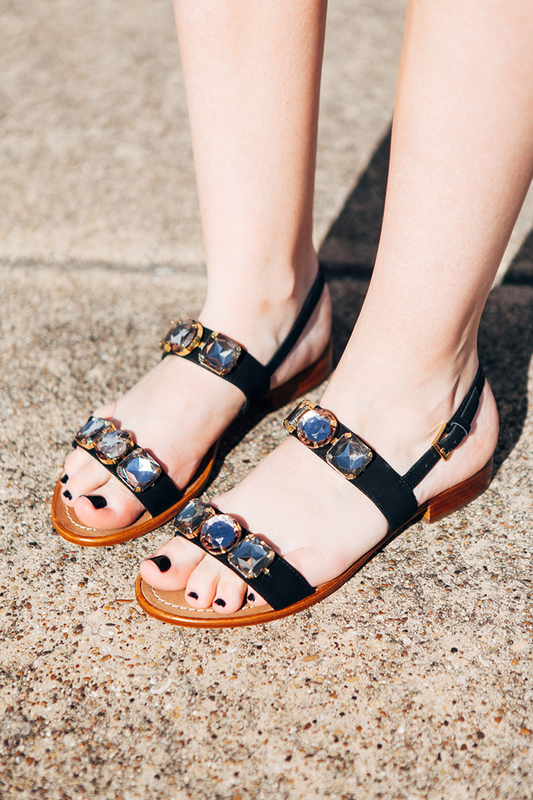 Jeweled sandals are definitely my summer staple haha! I own two pairs and yours are amazing too! This is SO chic and SO fabulous! Hope you had fun on Lake Austin this weekend :) Jealous! Merritt, that dress! Love love love! 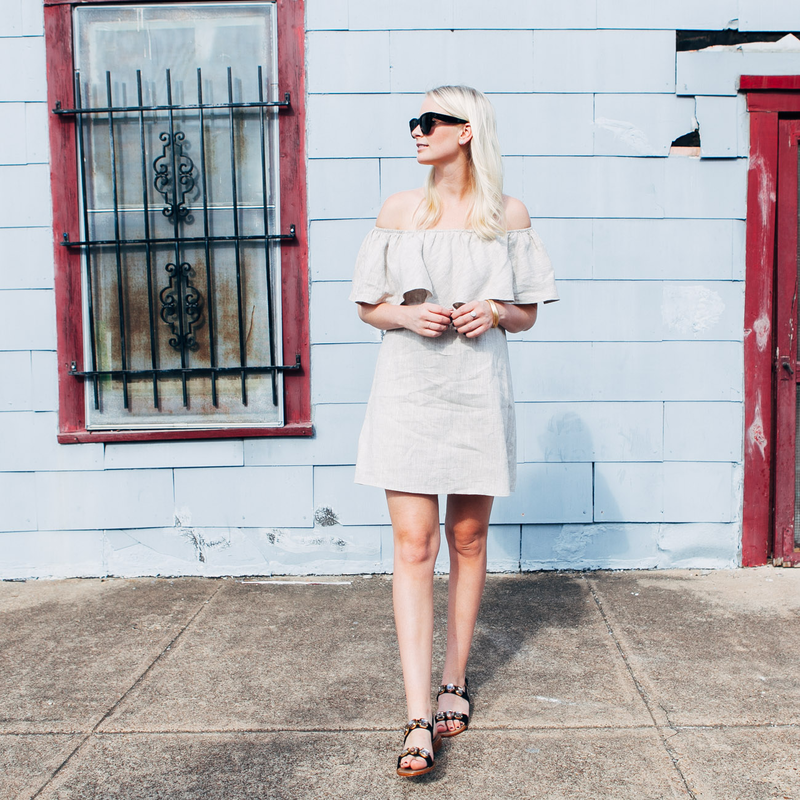 I have been looking for a great off the shoulder dress for the summer. Need to head into Reformation asap to try this one on. Love this whole outfit! That dress is so cute! Adorable!!! The sandals have just the right amount of jewels! P.S. Would love to have some of your height!!!!! love your dress and sandals. you look amazing! Super obsessed with this neutral look!! Love!!!!! I definitely know what you mean about not wanting to be the tallest in the room! What a great and thoughtful way of staying dressed up, and feeling feminine but ditching the heels for a change. Love the dress too! I am right there with ya on being the tallest girl in the room and I love that you embrace it! This look is stunning! I just love those sparkly sandals! 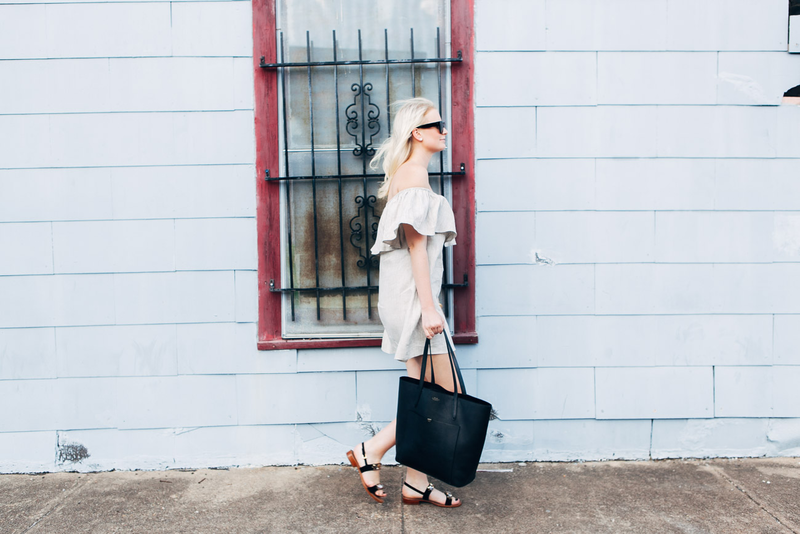 Flats definitely dominate my wardrobe. Love that dress on you! Small is sold out. Just wondering if it runs big, small or true to size? 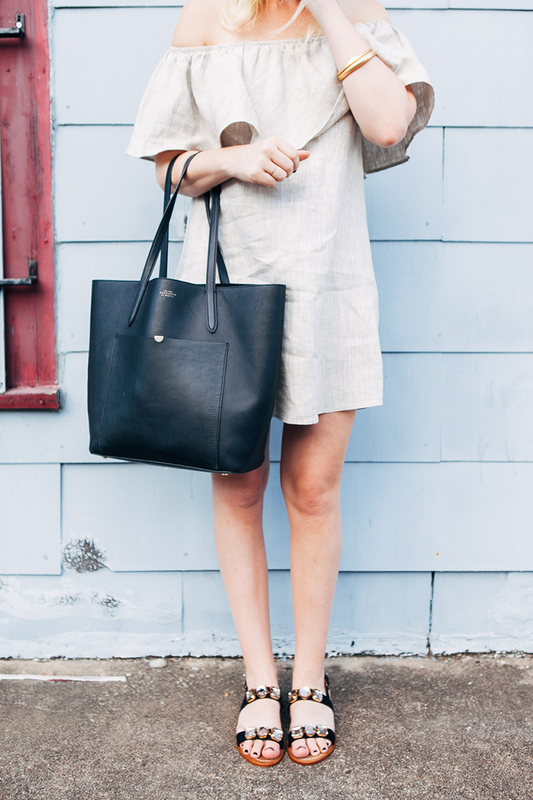 Love how you often wear neutrals, but they never look boring. Major fan of the sparkly sandals too! I knew you were tall, but never realized you are that tall! And this dress, is so cute and chic! I’m 5′ 10″ and so happy this dress looks like it will be long enough on me! I totally know how you feel! I don’t really worry about it any more, but let me tell you, I hated it in middle school. I am 5’10” flat footed. I love your chic off the shoulder dress.